On June 4th, Toronto rock musician Matt Epp will release his new album Learning To Lose Control. The album is a blend of rock and pop with just enough hint of roots influence to add some sandpaper to the music. The record opens with a soulful twist in the form of the methodical rocker "Sleepwalking". That doesn't last long as the title track is smooth and soothing. "Hold Me" is a bright and sunny number which could serve as the perfect rebound song to get you through a summer breakup. "Shine On Through" and "War With My Heart" have a Ryan Adams quality to them. His rock stuff, not his country material. Epp's pop sensibility is on full display with "When You Know", which also features the vocals of Serena Ryder. There are moments on the record that are less enjoyable. The falsetto on "Maybe It's Not" becomes grating over time. There's a waster hippie vibe to "Leaving" that verges on acoustic jam band. Other tracks, like "Ice Below The Man" (despite a killer harmonica part) and the flamenco-inspired "Use Your Head", are simply too laid back to be engaging. It may work for Michael Franti, but it's lost here. Despite those uneven moments, Learning To Lose Control is a solid listen. I can't wait to hear how these songs translate to a live situation. 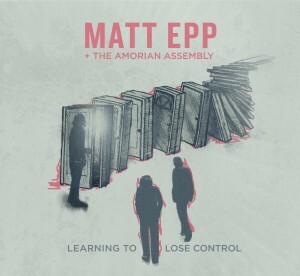 Matt Epp plays an album release show at The Piston in Toronto on June 26th. Best tracks: "When You Know", "Shine On Through"